Tucked away in the middle of Shafto Lane in Perth's CBD, The Creperie by Hexagone is a hidden gem of a restaurant serving authentic French Breton cuisine. As the name suggests, they specialise in crepes. But that's not all you can find on their menu. Creperies are common all over France, especially in their birthplace of Brittany. Savoury crepes known as galettes are often served as mains and the sweet crepes more commonly found in Perth are served as dessert. Here at The Creperie by Hexagone, you can find both. I had already had lunch when I found my way to The Creperie, but upon reading their men, and then re-reading it, I really wanted to try one of their galettes. Fortunately, my friendly waiter Adrian came to my rescue and recommended the Mon Voisin Jean-Luc, a brie and black pepper galette ($15). My galette arrived, delivered by the owner and chef himself, Arno Couvreur. 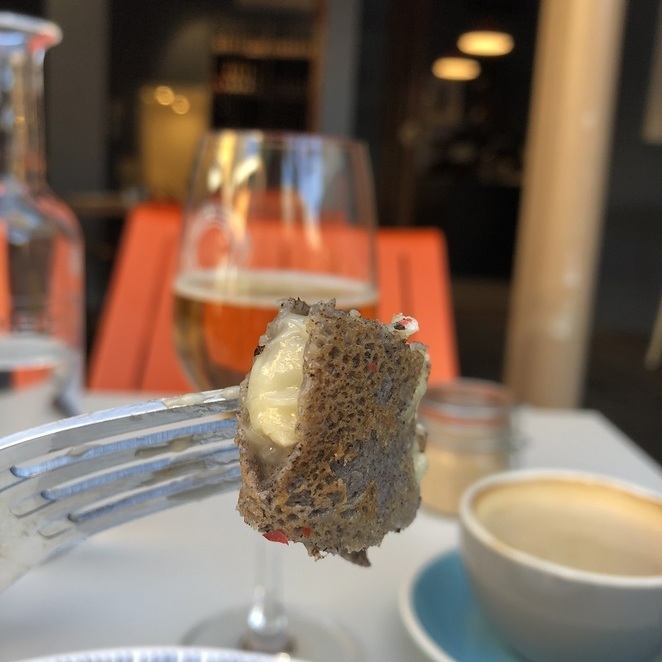 This first thing to reach my senses was the aroma of the fresh buckwheat pancake, followed by the muted, earthy scent of the brie and the sharp fragrance of the cracked black pepper. The pancake is airy, with a lovely crispy surface. Its flavour was deeper and fuller thanks to the buckwheat flour blend. The brie filling was creamy and slightly nutty, and its flavours were enhanced by the sprinkling of black pepper over it. All elements of this galette came together quite wonderfully, and for my very first galette experience, I was not disappointed. 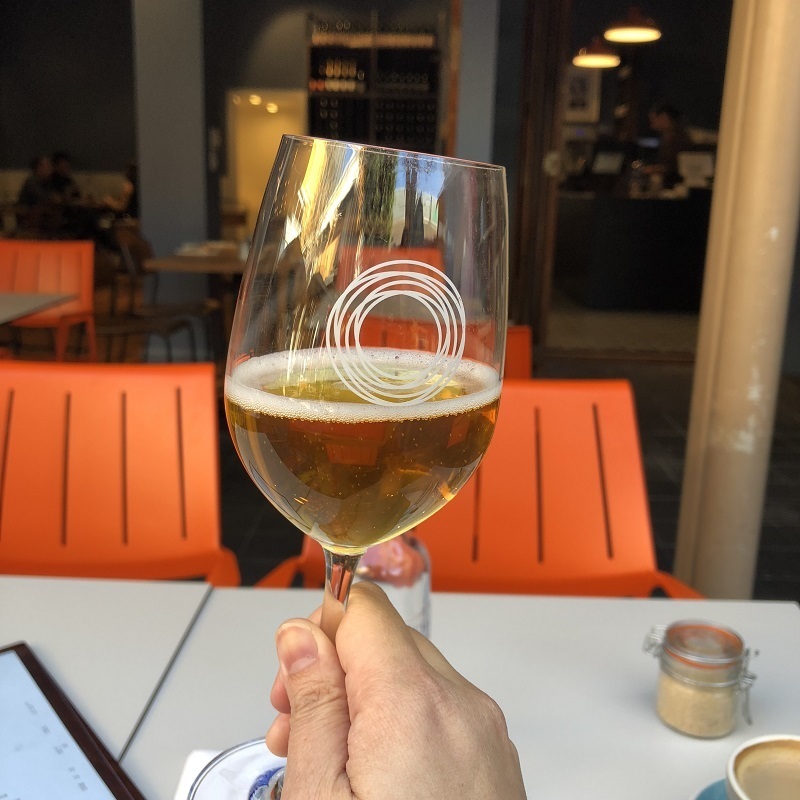 Halfway through eating my galette, I realised that it would be much better with a glass of something crisp, like a wine or a beer, especially on sunny Perth winter afternoon. Adrian recommended the Cidre Dupont Bouché Classique, 2014 reserve ($9 a glass). This is a lovely French vintage cider with a clear golden hue. The flavour is rich and reminiscent of bittersweet apple, with undertones of pear and berries. At the back of your palette, you can just catch a hint of the French oak barrels the cider was aged in. The mouth-feel of the liquid is quite reminiscent of mead, and there is only a tiny hint of carbonation, which I quite enjoyed. The cider - Cidre Dupont Bouché Classique, 2014 reserve. However, be warned that stock of this cider is limited, as The Creperie have yet to find new stock of this particular cider. 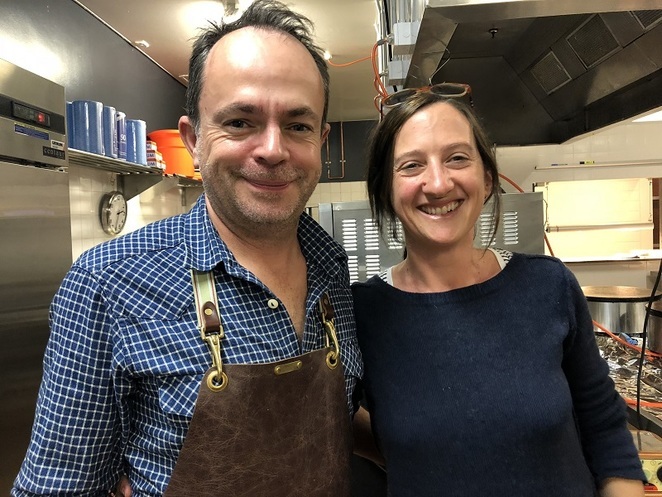 The Creperie is run by a husband and wife team, Arno and Julie, who after travelling the world, decided to settle down in Perth. 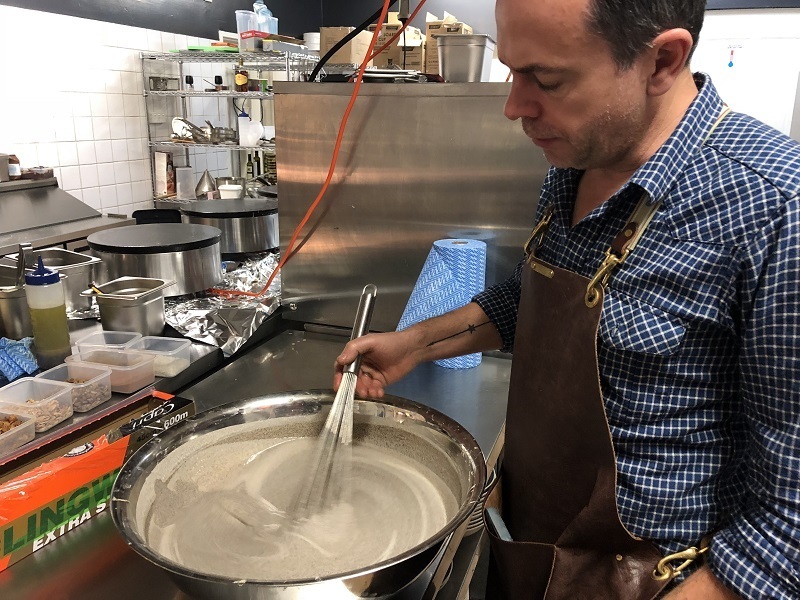 Just over two weeks ago, they opened The Creperie by Hexagone as "it was about time Perth had a true authentic creperie like we have in France, and especially in Brittany, the land of crepes and buckwheat galettes." 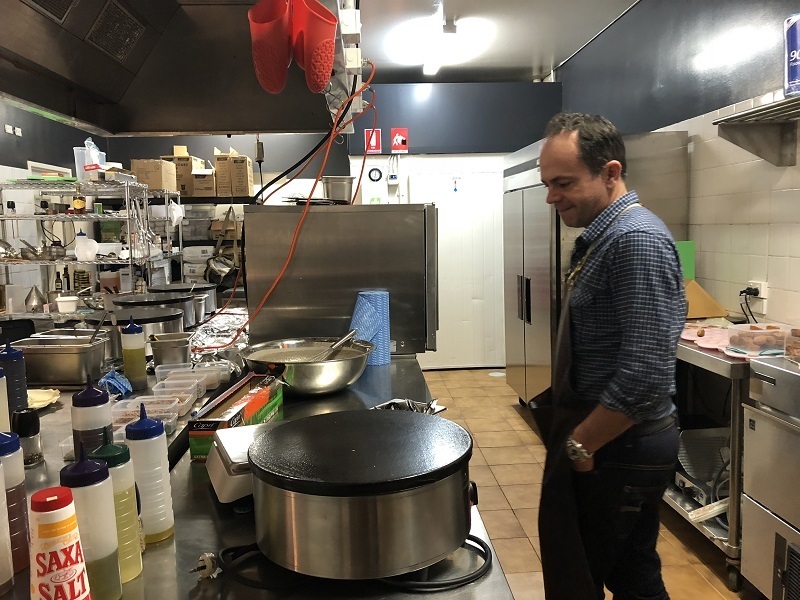 After I finished and paid for my meal, Arno even gave me a tour of The Creperie's kitchen. Arno showing off the kitchen crepe pan. The galette mixture containing both Australian and French buckwheat to give the pancakes their distinctive colour. 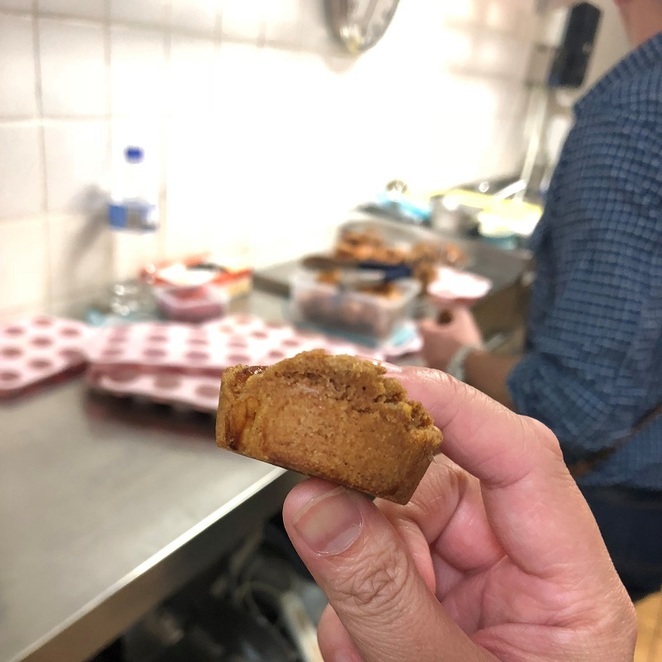 I even got to sample the freshly made Palets Bretons, Brittany butter biscuits made with wheat flour and buckwheat flour. And boy, were they tasty, with a background hint of nutty, baked butter. These aren't on the menu yet, but they will be soon, so keep an eye out for them. Palet Bretons (Brittany butter buscuits). Even though they only serve galettes and crepes, don't be fooled into thinking that there isn't much variety. Their galettes have a wide range of fillings, from the simple cheese, ham and eggs (Port-Tudy - $16) to the more international kimchi, egg and nigella (Old Boy - $15). There is even a vegetarian option in the pumpkin, seeds, kale and balsamic vinegar (Cendrillon - $14) galette. 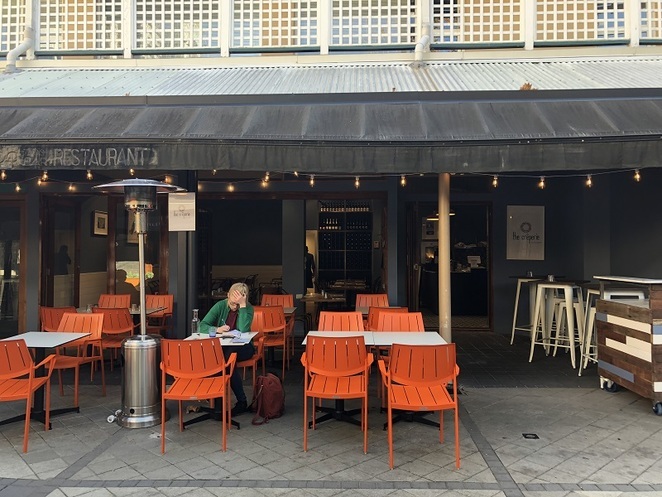 Even the crepe selection will leave you spoilt for choice, with delicious sounding options like the homemade salted butter caramel crepe (L'Ami Bastien - $13) to the roasted pineapple, rhum and mint crepe (Saint-Barth - $14). For the gluten intolerant, this place is a godsend. Their galettes are made with a mixture of Australian and French buckwheat to give them their rich, dark colour. 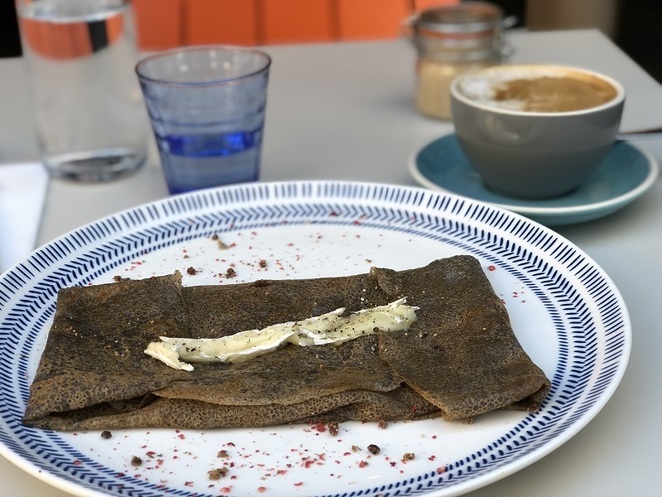 And while the crepes themselves are usually made with wheat flour, you can request that they be made with buckwheat flour. A full meal here usually consists of one savoury dish (the galette) and one sweet dish (the crepe). And of course, you can always order more if you're hungry. If you're in Perth city for lunch and would like to try a full meal here, they currently have an express lunch special which includes two courses and a coffee for $20. My only disappointment was that decaffeinated coffee wasn't available, as according to Adrian the waiter, the place is more of a restaurant than a cafe. It would be nice if they did, as The Creperie is a lovely spot to have a dessert late in the day with a coffee that will not keep one up. And if you're wondering what The Hexagone portion of the restaurant's name means, I did too. Turns out it is what the French call France. This is because the country is shaped like a hexagon. 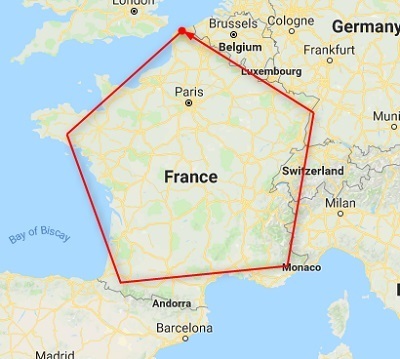 France really is shaped like a hexagon. The Creperie can be found at the site of the now-closed Belasyse restaurant. It was a massive shame when The Belasyse closed down, but The Creperie looks like it is shaping up to be a worthy replacement. So what are you waiting for? Head down to The Creperie by Hexagone today, and have a glass of cider with your galettes and crepes, just like how the French do it.